Shadow Education Secretary Stephen Twigg has joined the schools debate with an education speech at the Royal Society for the Encouragement of Arts. This education speech by the Member of Parliament for Liverpool West Derby is likely to win him friends in the public education field. Probably because he’s not Michael Gove MP, the Secretary of State for Education, whose school reform speeches can be problematic. Unusually his education speech took three themes: freedom, devolution and collaboration. But he stayed true to those themes throughout the speech. As Andreas Schleicher says, collaboration doesn’t just fall from the sky. Here there is an important role for central government. As the enabler of collaboration. Short non-sentences do work in speeches, but not in too great a quantity. Not new duties, but giving teeth to existing responsibilities. It is strange and I suspect that its source is the Commons debating chamber. I’m not sure whether he’d intended for the title of his speech, “No School Left Behind,” to have echoes of a George W. Bush legacy. Somehow I doubt it. But President Bush’s “No Child Left Behind Act” was probably closer to the former Labour Government’s school apparatus of test, checks and controls than many would expect. A school system based on evidence not dogma. That is what a One Nation schools system is about. That means schools working together. Working in collaboration to spread excellence. It’s all there. 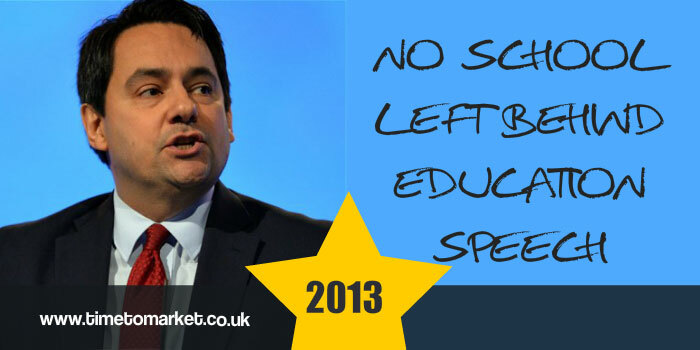 Everything an audience could hope for from an opposition front bench spokesman’s education speech. When you are ready to practise your next speech you can always work with a skilled assistant. A half-day skills refresher could be the perfect opportunity to refine your speech and prepare for your big speaking event. So, when the time is right, please don’t hesitate to get in touch.